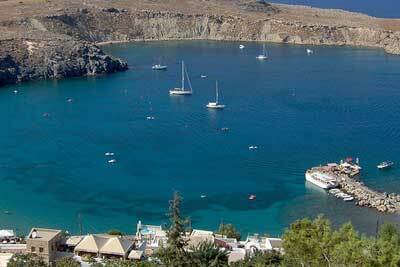 Most go to Rhodes for sun, sand and sea. And, with average temperatures of 31 degrees celsius in July and August, who can blame them? But Rhodes has a considerable history too. The city of Rhodes, situated at the north-east tip of the island, was founded in 408 BC and was named a world heritage site in 1988. It its early days Rhodes was famed for being home to the Colossus of Rhodes, one of the seven wonders of the ancient world, a 30 metre tall statue built in honour of the sun god Helios. 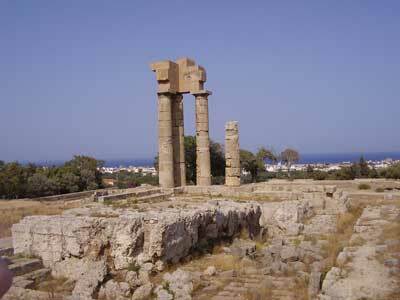 Rhodes was later conquered by the Romans, the Arabs, the Knights Hospitallers, the Ottomans and then the Italians. Despite this upheaval, and heavy bombing during the second world war, the city of Rhodes remains an intriguing destination. Visitors will enjoy walking through its narrow, cobbled streets, and taking in the 15th century Grand Master's Palace (which, though damaged by an ammunition explosion in 1856, was rebuilt by the Italians and later used by Mussolini), the Knights Street, the Acropolis of Rhodes (pictured), the Mosque of Suleiman the Magnificent, the Ancient walls, the Gothic buildings and the busy port. The Colossus, alas, does not survive: it was destroyed by an earthquake in 226 BC and not rebuilt for fear of causing offence to Helios. where? The city of Rhodes is situated at the north-east tip of the Island, about 16 km from Rhodes' airport. £$€¥There is no charge to enter the city of Rhodes. Lindos is a small town, archeological site and beach resort found on the east coast of Rhodes. It is most famous for its acropolis, a natural citadel, risisng above the modern town, which was featured in the Guns of Navarone. The acropolis is interesting because its initial temple (built in the fourth century BC) has been supplemented by various other structures, including a Rhodian warship cut into the rocks, a hellenistic staircase, the Castle of the Knights of St John (used to try to stave off the invading Ottomans), and a Greek church (dating from the 13th or 14th century). The town itself is small, home to about 4000, but contains a number of decent eateries. But most flock to the sandy, gently curving beach. The bath-warm water is shallow, tranquil and clear, making swimming an absolute pleasure. For those looking for something more exciting, the usual range of beach watersports are also available. where? Lindos is on the east coast of Rhodes, about 50 kms from the airport and from the city of Rhodes. when? The best time to travel to the Greek islands is between April to November (though the temperatures in July and August may be too high for some). £$€¥ The entrance fee for the acropolis is €6.